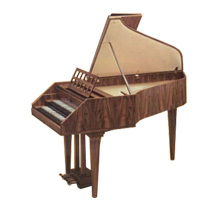 Keyboard: Naturals of ebony, decorative boxwood arcades; sharps and flats of bone-covered pearwood. 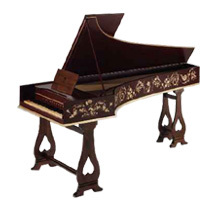 For reasons of reliability, the copy is equipped with Delrin plectra, instead of the raven quills used in the original instrument. 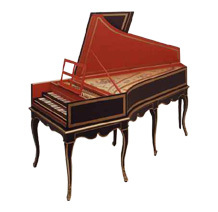 Among the surviving harpsichords of Blanchet, the J.C. NEUPERT workshops had access to a single manual harpsichord, made in 1737 by Fran?ois-?tienne, which was the model for our copy. 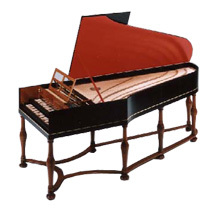 The sound of this single manual harpsichord was so convincing that J.C. NEUPERT decided to develop a double manual version of this outstanding instrument. 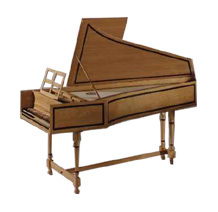 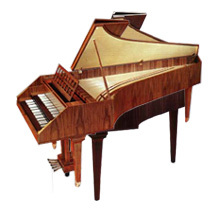 NEUPERT's design of the "Couperin" harpsichord in terms of the construction, acoustics, and basic touch was chosen in accordance with the spirit of the period of the first half of the 20th century. 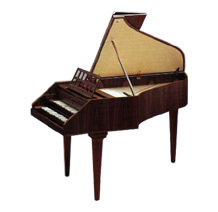 Mr. C. Mercier-Ythier, the former owner of the instrument, describes the sound of this instrument as follows: "It possesses a well-rounded sonority in the bass, a warm tone in middle range and very clear treble, which never sounds aggressive. 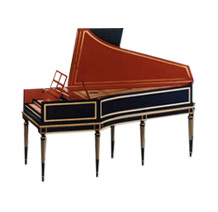 This makes it one of the most beautiful harpsichords, both in the tonal and in the aesthetic sense..."